Mehndi art is a traditional way of adorning hands and feet with a paste made up of henna leaves. This kind of body art is mainly popular in South Asian countries like India, Pakistan, Bangladesh, Nepal, etc,. 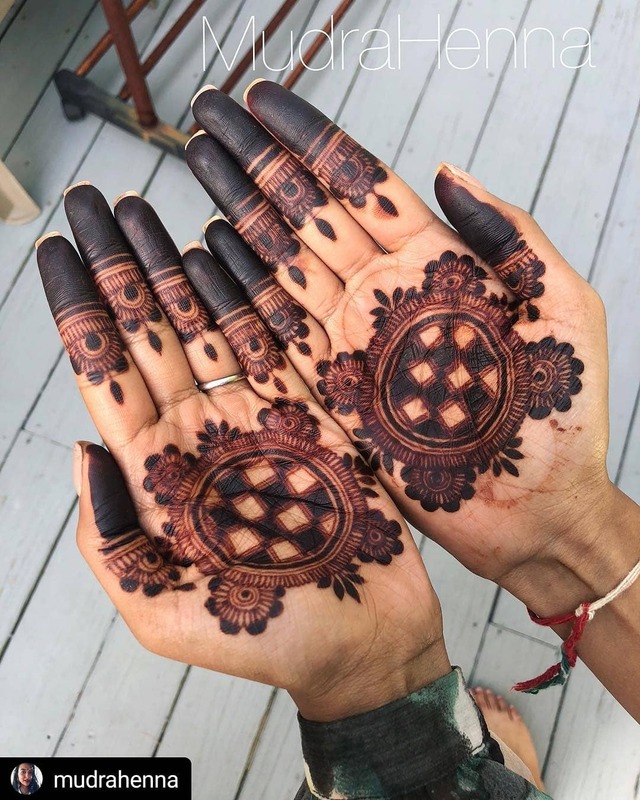 Besides these countries, there are a lot of western countries as well where people are catching up with the concept of mehndi art and they refer mehndi designs as henna tattoos. Mehndi holds a lot of symbolic value from the ancient times. In South Asian countries, Mehndi is considered very auspicious during festivities and special occasions. 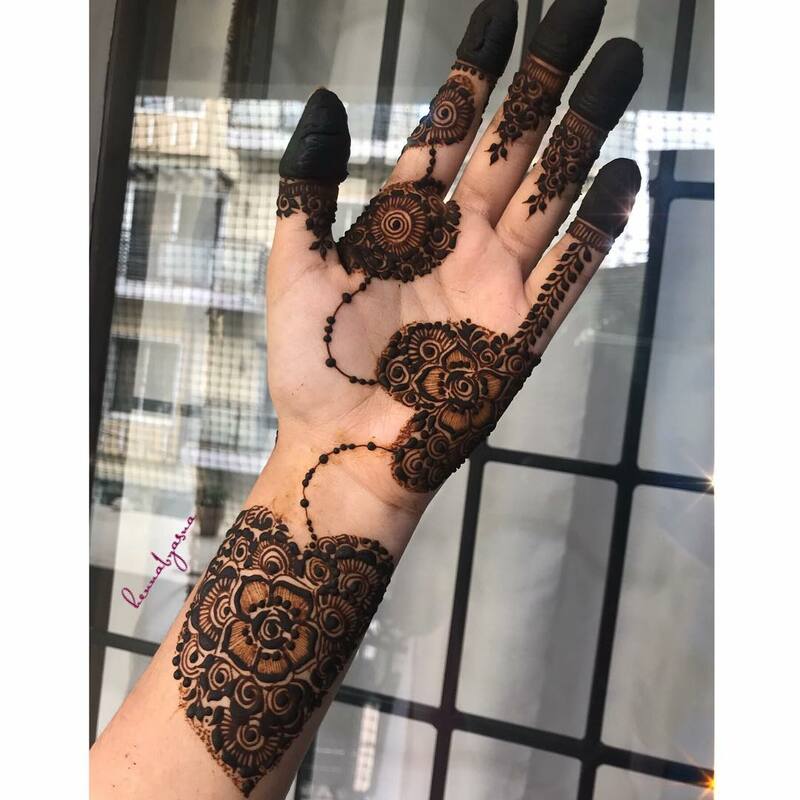 From weddings, teej, karwachauth, eid to Diwali – all of these occasions are incomplete without the sweet smell of mehndi and the beautiful intricate mehndi designs on the palms of women! 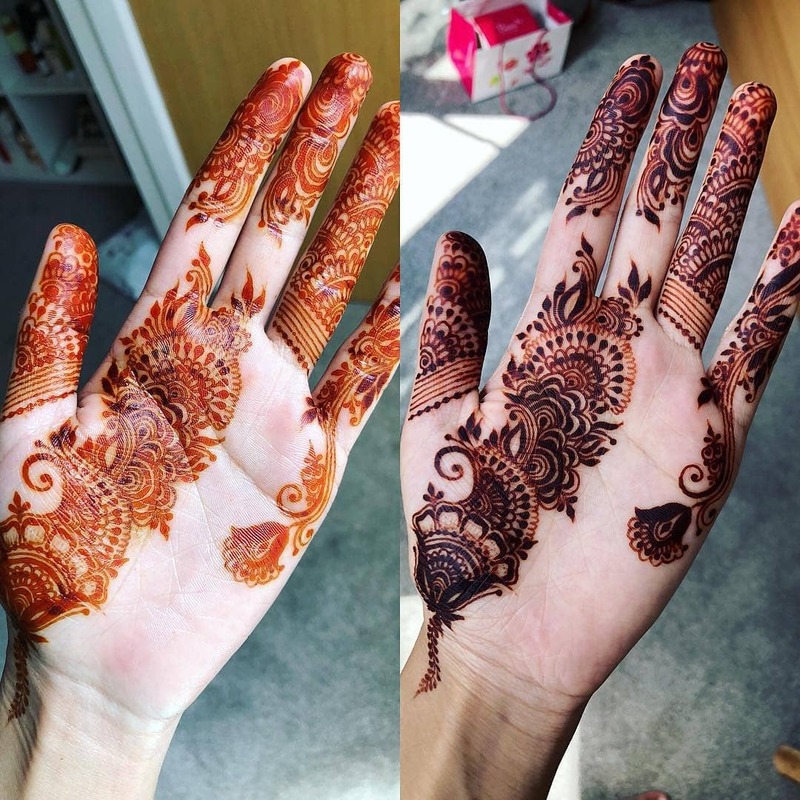 And of course, how can we forget about the pre-wedding mehndi ceremony where both, the bride’s and the groom’s families apply mehndi on their hands, celebrating the occasion like a full fledged festival! Choosing a mehndi design is literally the most confusing task ever when you have like a gazillion of mehndi designs out there to choose from. 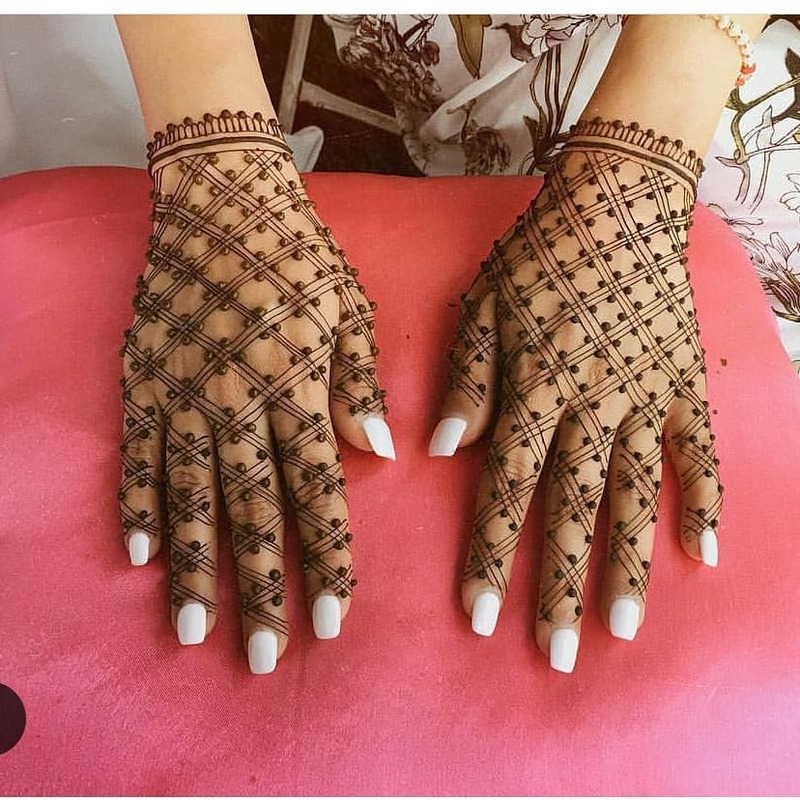 The Internet is flooded with so many mehndi designs that it is hard to not get confused about which design is currently in trends and which one would look the best with the occasion you are applying it for. 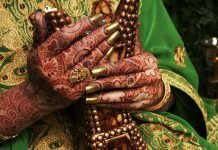 In this post, we are sharing 15+ latest mehndi designs for 2018 that you are going to fall in love with. 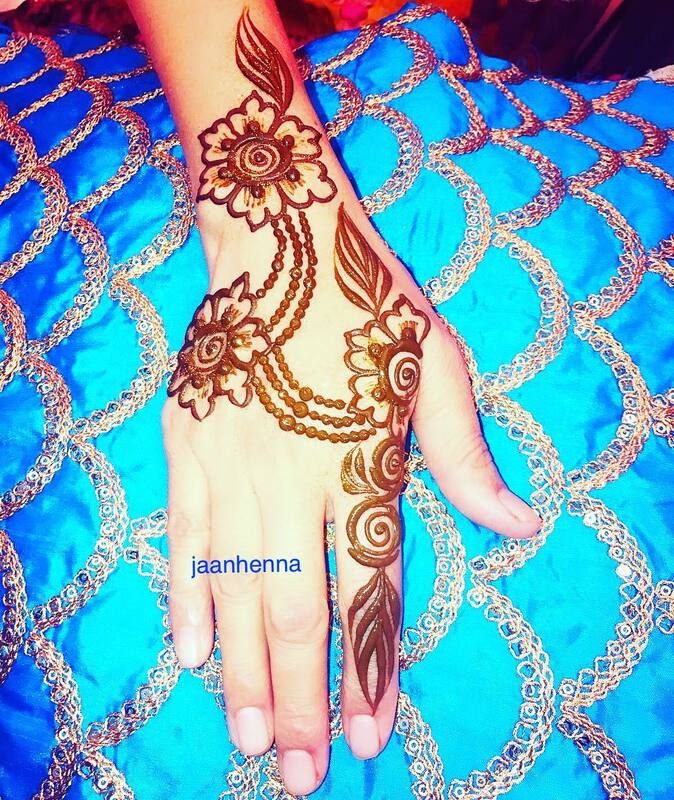 This post will end your search for the perfect mehndi design you are looking for! Oh, and these designs are beginner-friendly too! This design imitates the design of hand chain / hand harness jewelry which is known as “Hathphool” in Hindi. 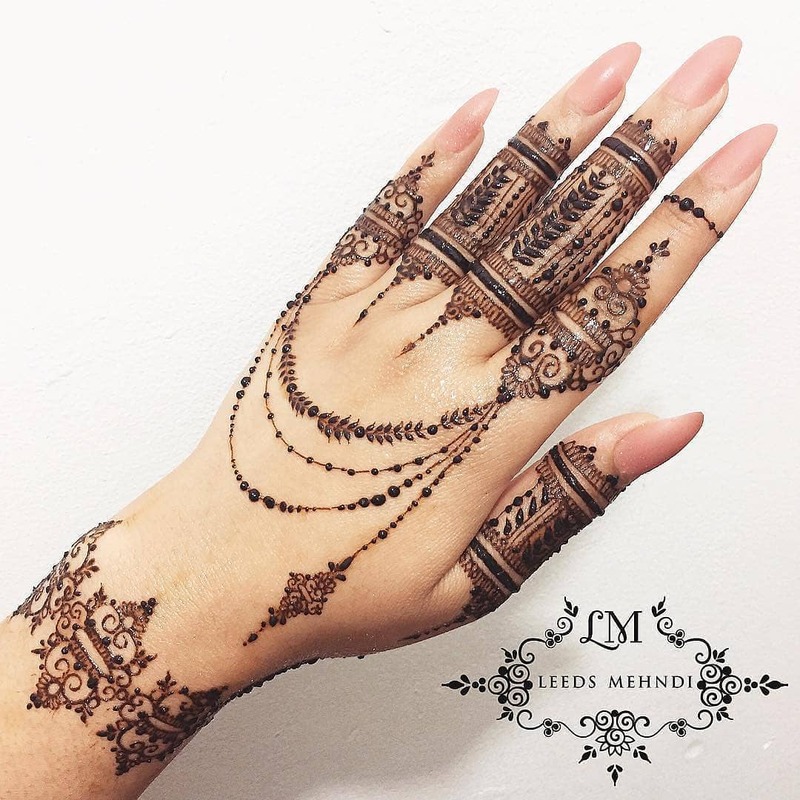 It is a mixture of traditional and modern mehndi design that would look the best on the back of your hand instead of on your palms. Indo-western mehndi design is what I will call it! Applying mehndi is not that easy for a beginner.. But they say, practice makes a man perfect! 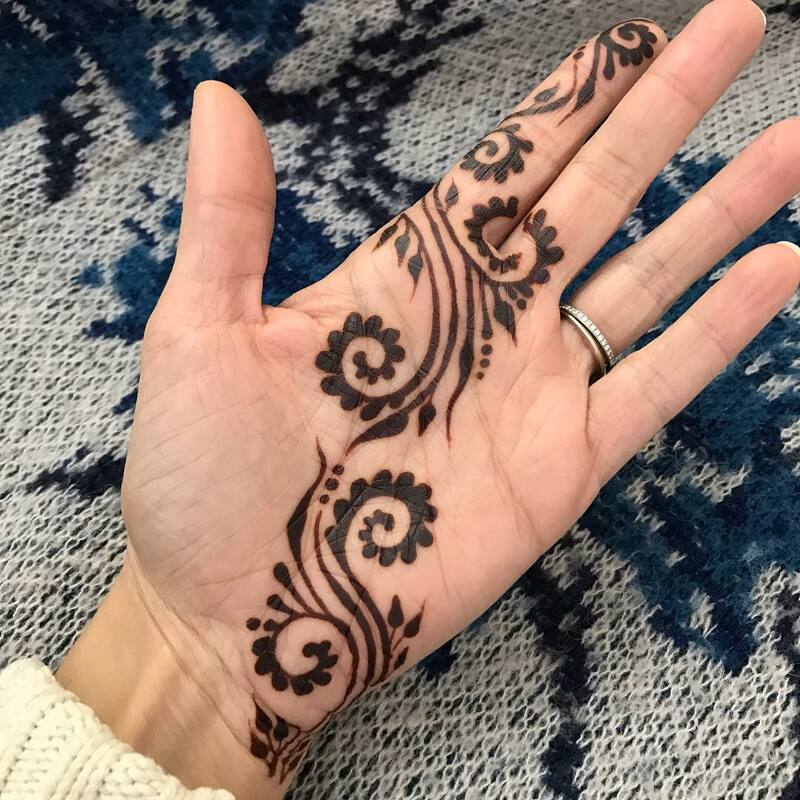 So if you are a beginner and you want to try out an easy mehndi design, take some inspiration from this very easy diagonal mehndi design. It is also referred as bel mehndi design and it must be actually the most popular mehndi design type out there. Most mehndi designs are drawn in such a way that they cover the whole palm area. I found this design very unique as it has left out all the area in the middle of the palm. 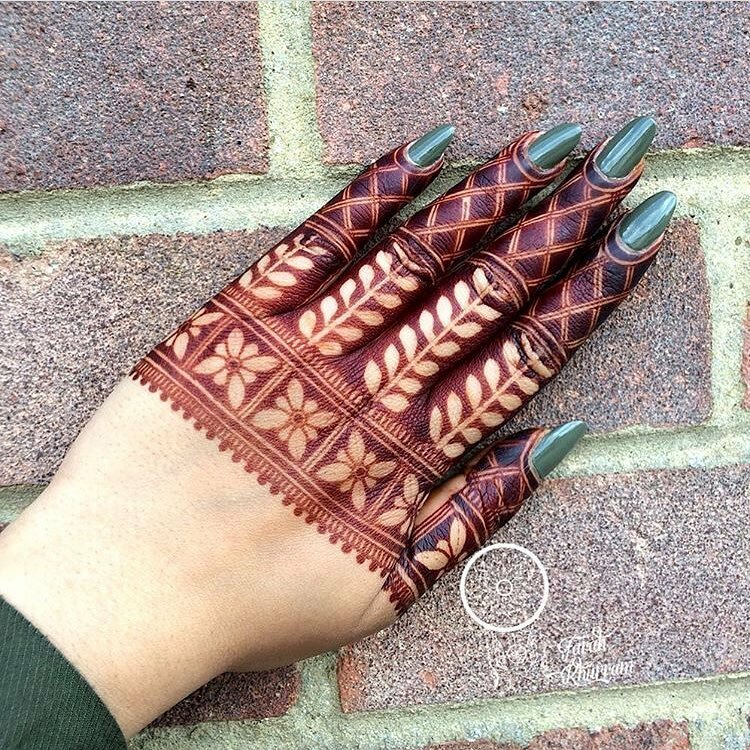 The design is drawn just on the fingers and wrist, with a simple bel design chain putting the whole look of mehndi together. 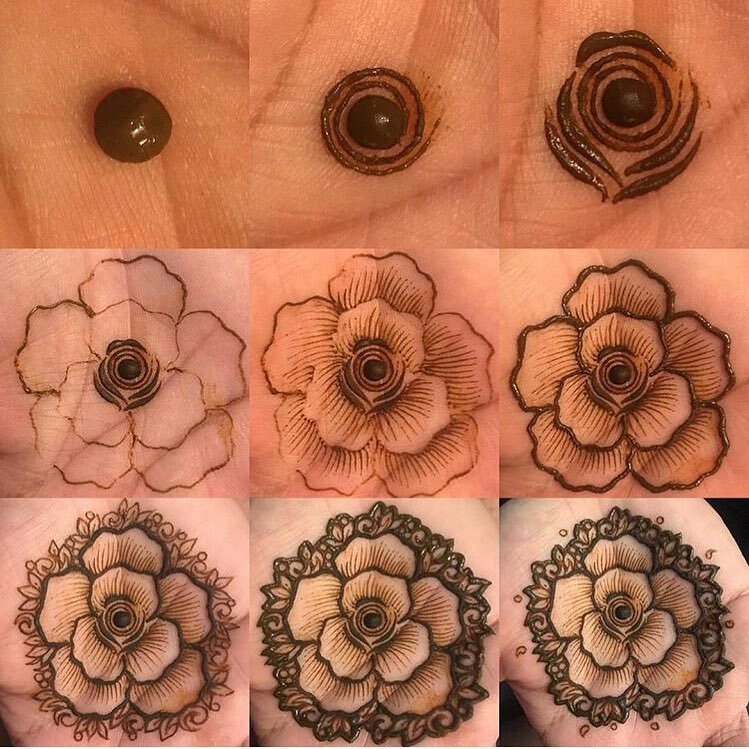 This would be a perfect rakshabandhan mehndi design for 2018 as it is so easy yet so beautiful! 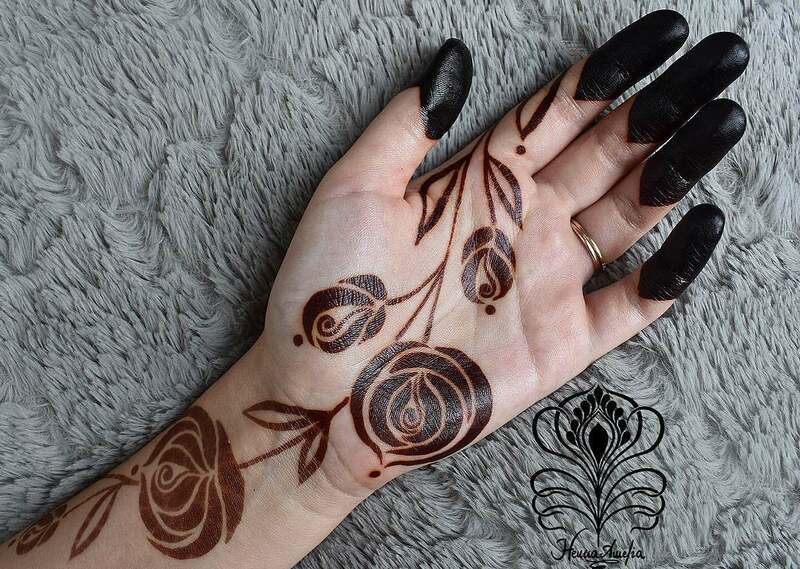 This design is drawn on the back of the hand, but you can surely replicate this gorgeous roses and zalidar design on your palm as well. Another one with the same kind of patterns, this one is a little more intricate than the previous one. Rose patterns look the prettiest when drawn with mehandi, don’t they? Mehndi art doesn’t always have to be traditional, it can be funky too! Take this cute elephant design as an inspiration. It will be an ideal design mehendi for kids as they love such kind of quirky art, don’t they? …only if you can get them to stay still while you apply mehndi on their palms! What can be more simpler and easier than a grid mehndi design? If your hands are steady enough to draw such long diagonal lines multiple times, you can do this mehendi design at home easily. However, if you have striping tape which is typically used for nail arts, you can use it as guide for more precision. Roses are forever! 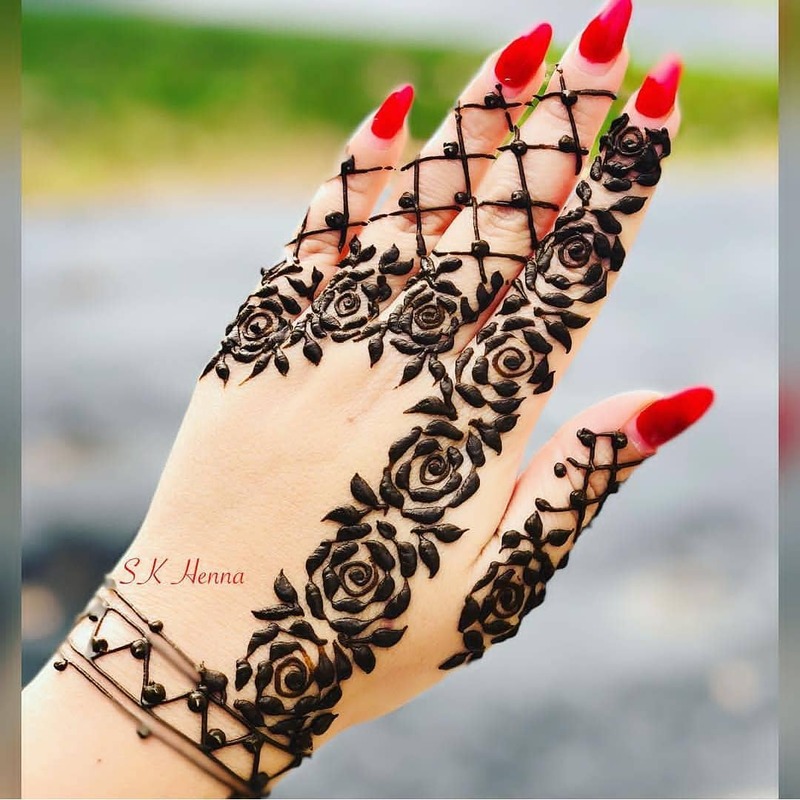 Draw this subtle roses mehendi design, that also has bracelet mehendi patterns, for just any small occasion or when you are in want to draw a design quickly. YouTube is literally filled with mehendi tutorials with which, you, as a beginner, can learn drawing the mehendi designs with ease! 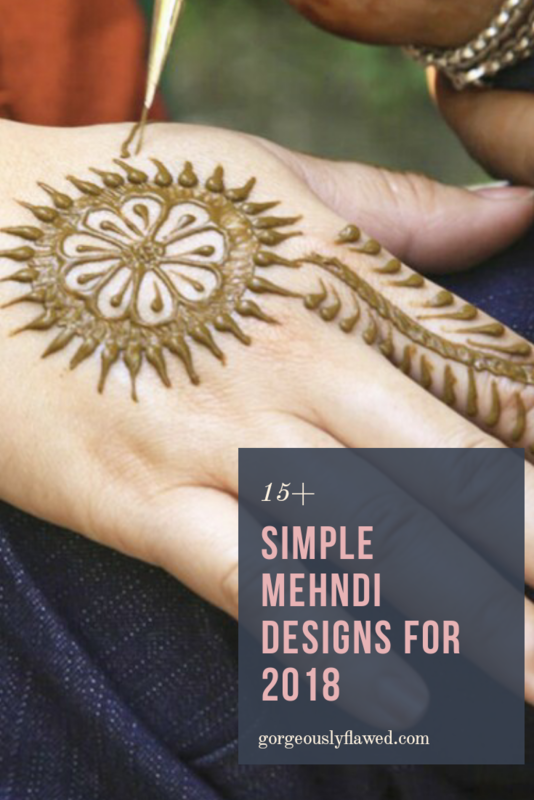 I found this very simple tutorial for Arabic mehndi design which is quite popular in India. 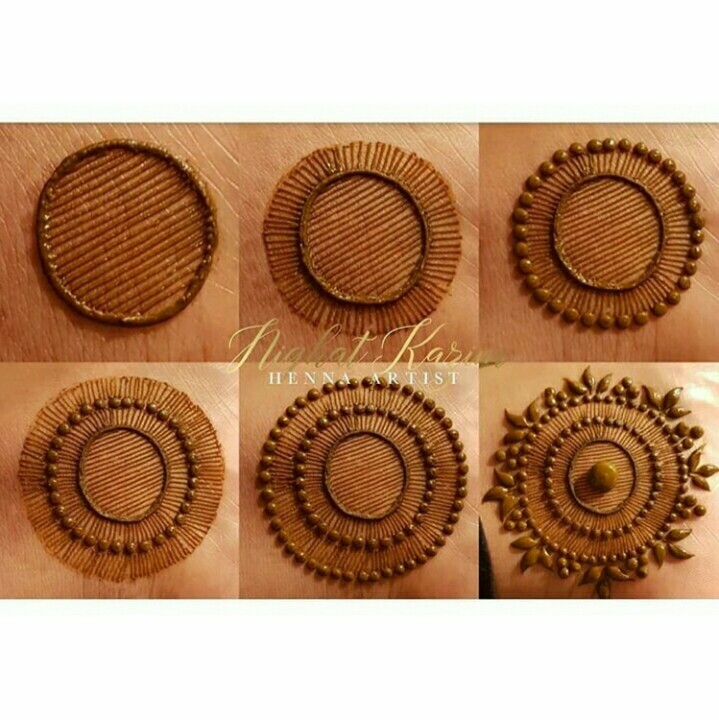 You can surf more such tutorials on their channel! 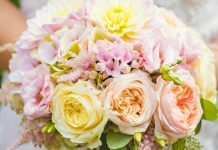 This kind of design has always been in the trends, because floral is forever! The connecting chain design in this one gives it a more of a modern look. 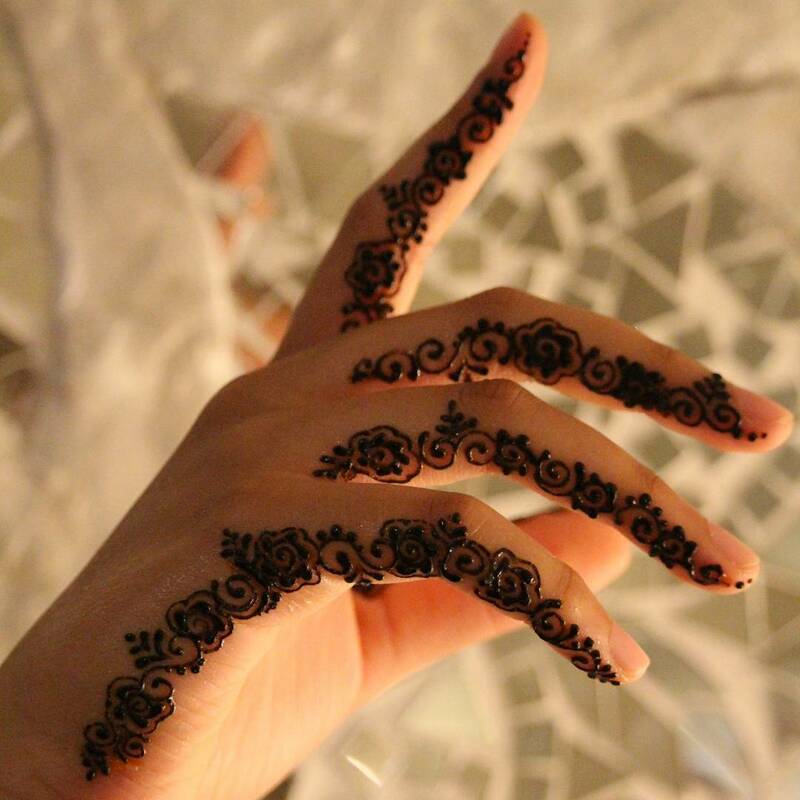 It is not as simple, but after looking at its beauty, you would surely want to get this design drawn on your palms. It is more like a negative space mehndi design – which they refer as *grid* design in the mehndi world, I think. Speaking of grid design, here is one more inspiration for you! 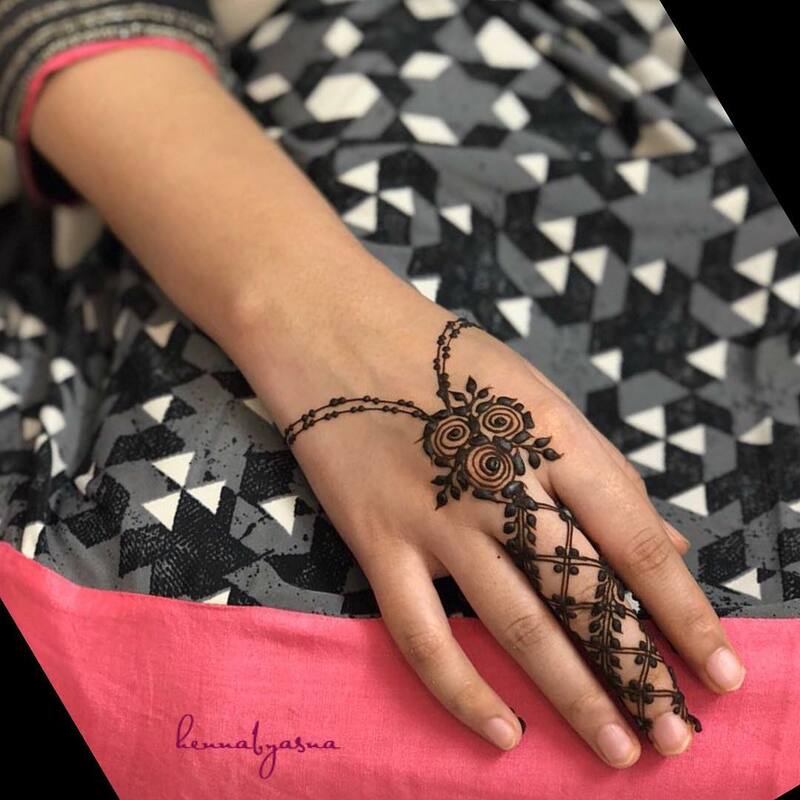 Intricate designs like this one are not that easy either, the best way to draw such designs is keeping two separate mehndi cones – one with a very fine tip for intricate patterns and other one with a thick tip for thicker patterns. Even a beginner would be able to draw such intricate designs with two cones. 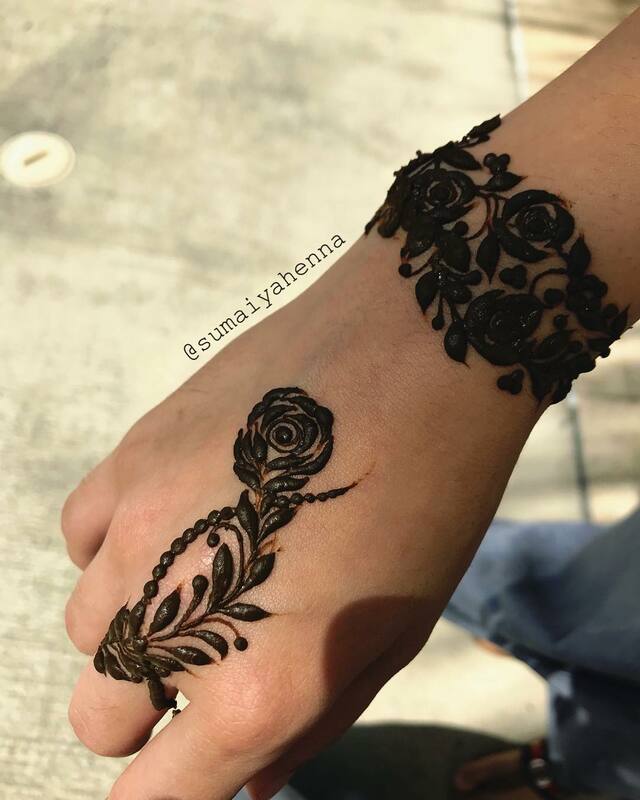 The henna artist herself believes that this is a one of a kind design! You will rarely come across such designs, but I can already see it trending in 2018! It is a minimalist design which people would barely notice. But I feel it would make a great engagement mehandi design, wouldn’t it be one? What a cute way to draw your loved one’s initials with mehndi.. Or if you are single like me, you can put your own initials – no one is gonna judge you. #SelfLove! 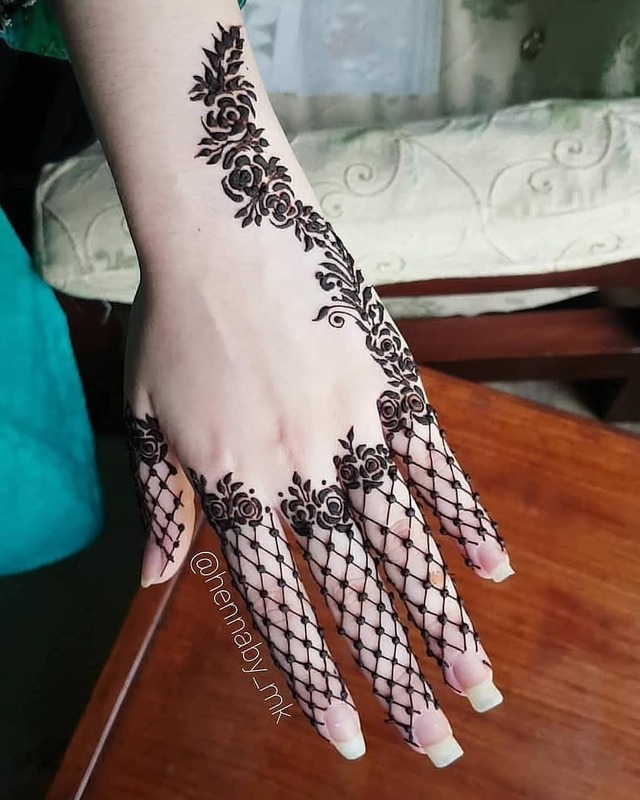 😉 This design is ideal for those brides who are not big on mehndi and just want to get a simple design drawn on their palms with their beau’s initial in it. There are two benefits of bold mehandi designs like this one. 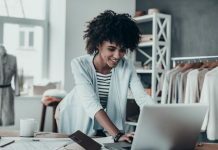 Firstly, as a beginner, you have far less chances of messing up the design if you are drawing bold patterns. Secondly, this kind of design gives a very dark and beautiful stain – and who doesn’t want that?! 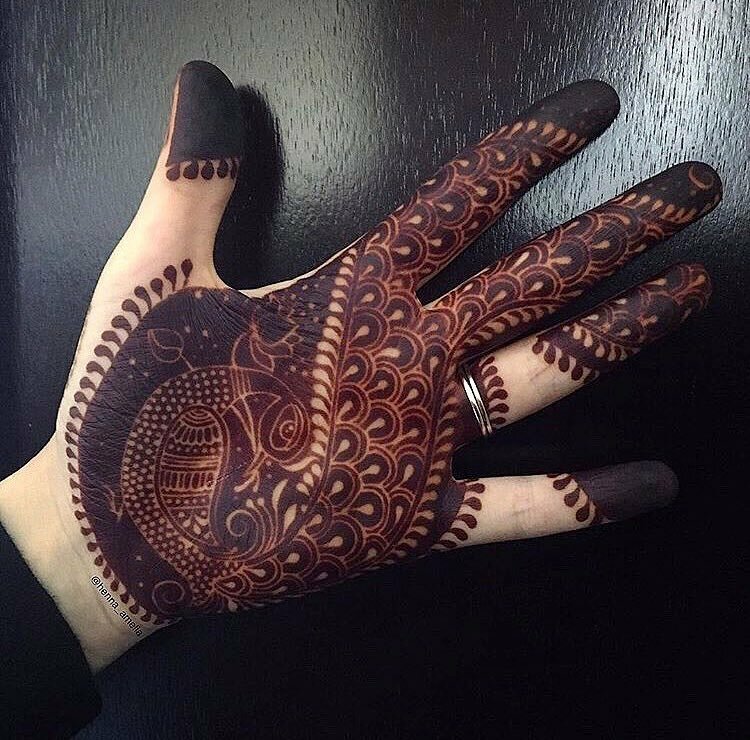 That’s the magic of henna paste, bold patterns always get darker stains than intricate designs. This instagram account shares a lot of step by step tutorials that can help you to draw even the hardest kind of designs very easily. 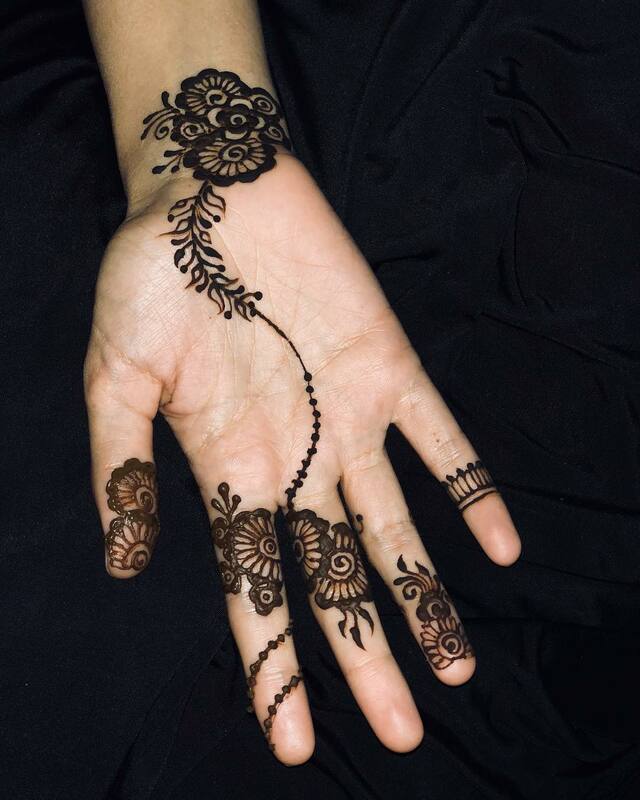 The design shared above is perfect to be drawn on the middle of the palm, just like a traditional mandala design. Here is another step by step tutorial, this time for a beautiful rose mandala design. 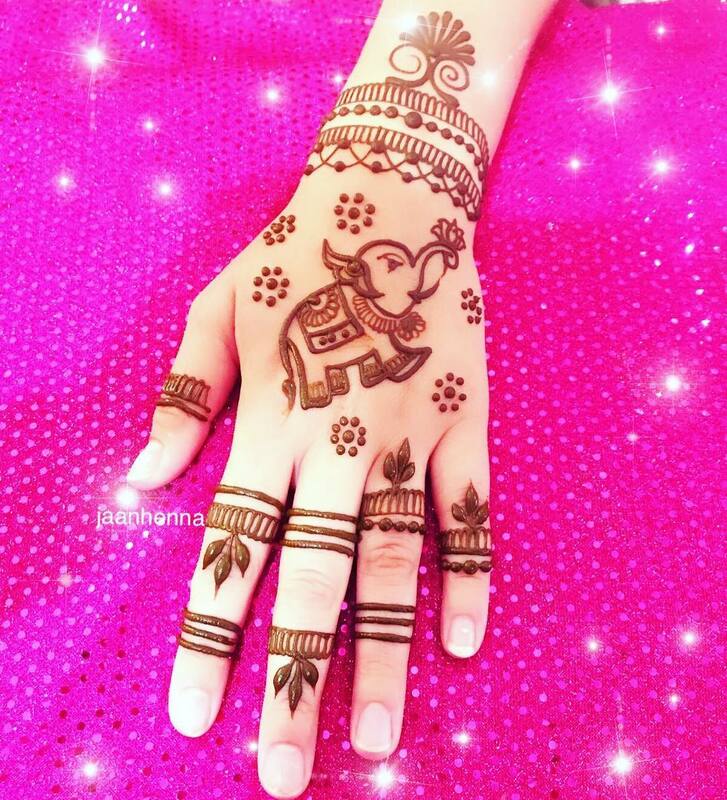 Brush up your mehandi drawing skills with this one! This traditional mandala design has a modern twist with the square, geometric patterns going on in the middle. The design is pretty much beginner friendly! 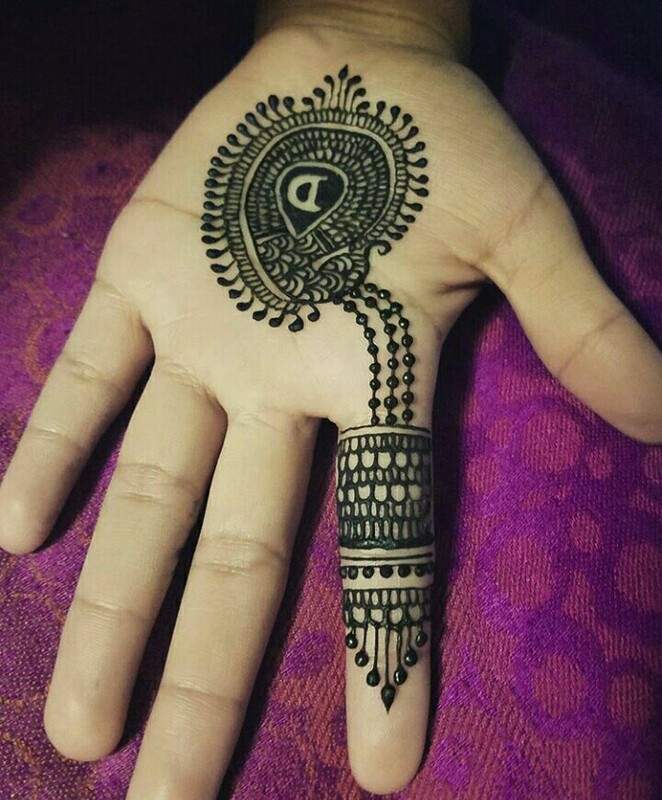 Simply beautiful – that’s all I want to say for this mehndi design. There is beauty in simplicity – the design defines this statement very well. With the festival of rakshabandhan approaching soon, you must be looking for a mehndi design which is elegant and doesn’t look OTT. This is the one you should go with! Spread the love in the air with this heart shaped design and intricate patterns. Which trendy mehndi design did you like the most? Comment down below. Also check out our other post about Glitter Mehndi Designs. If you liked the post, share it with the world by pinning the image above!